You know how Brussels sprouts have that reputation as a hated vegetable? Especially for kids? I never had that...and I think it's because I have absolutely no recollection of ever eating them. (That's not because my parents thought it was a lost cause--I have a sneaking suspicion that my dad didn't want to eat them, so they were never part of the dinner repertoire). My parents were so good about making us eat food we might otherwise say no to--we were required to take a "no thank you helping" of anything we didn't really want to eat which instilled good manners if we were eating at someone else's house, and also expanded our little palates. [Note to future children: you will be carrying on the "no thank you helping" tradition. You can thank me later]. Preheat over to 400 degrees. 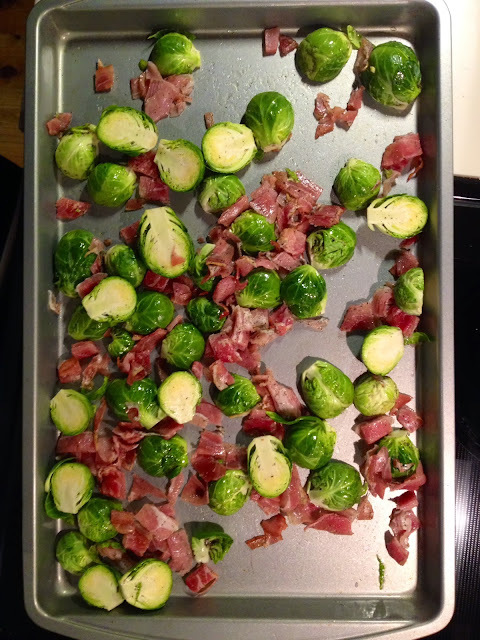 Take a 1 to 1-1/2 pound bag of Brussels sprouts and cut them in half. Cut up some prosciutto into 1" squares (around 4-5 ounces). Put everything on a baking sheet, drizzle with olive oil and sprinkle with salt and pepper. Toss with your hands. Cook for 15 minutes, toss, and then cook for another 15. Drizzle some balsamic vinegar on top (I did around 2 tablespoons) and voila! (If you want a more pronounced balsamic flavor, I would recommend this recipe, although it is a bit more labor intensive). No thank you helping? You're welcome! 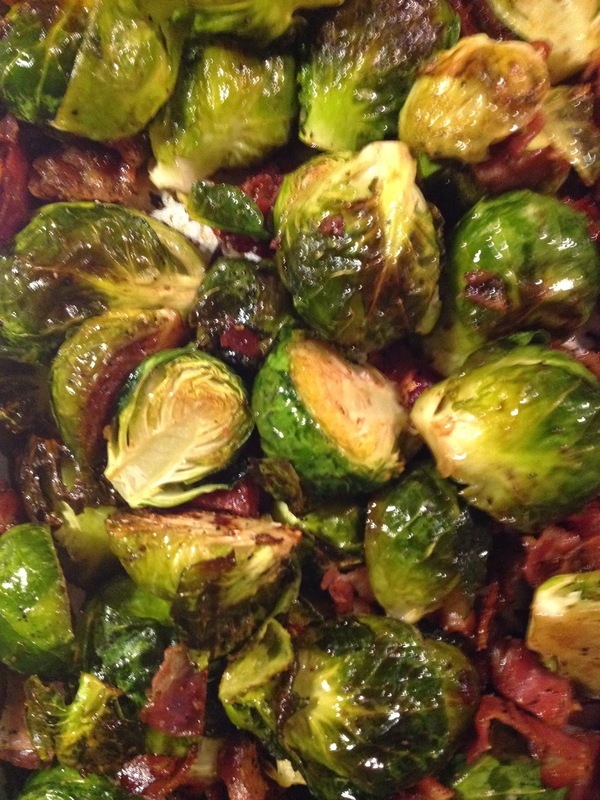 And those sprouts will be making an appearance for Thanksgiving dinner! I am not a fan, of BS, but this looks pretty good! I may have to try. Anything with prosciutto is heaven in my book.